Everywhere around the world, people are recognizing the interdependent relationship between a strong rule of a law, a competitive economy, and a high quality of life. The rule of law improves transparency and strengthens institutions. As public institutions are more stable, economies become stronger, quality of life rises, and people have more confidence in their own society. Thus, a cycle of strength and faith is born. The rule of law is generally understood to have three meanings: First, rule of law is a regulator of government power. Second, rule of law means equality before the law. Third, rule of law means procedural and formal justice. The rule of law is important because it acts as a limitation to discretionary government power. The stronger the rule of law, the more firm it is when the government tries to exert arbitrary rule. This is particularly important when a government attempts to change laws. Without a rule of law, society would exist in a state of chaos, or put more extremely, society would not exist. There would be no order, nor certainty. Instead, anarchy could reign through men and manipulation of power. A strong rule of law acts to protect society from the caprices of humans, and safeguards the rights of individuals by acting as the final threshold. All men are equally subjected to ordinary law, and no man is above the law. Finally, certainty is guaranteed through a consistent system of abstract rules. This is a method of achieving justice by consistently applying rules and procedures that shape the institutional order of a legal system. Without procedural justice, arbitrariness can take over again. It is not just the presence of procedural rules that ensures the presence of the rule of law. No degree of substantive law, not even the existence of "best practice" laws with bring the rule of law to a country would effective enforcement. Moreover, we cannot be fooled by structures that often go hand in hand with the promotion of the rule of law. These are structures such as democracy or free markets. While these structures aid in the promotion of the rule of law and vice versa, they can obscure a lack of constitutional or legal limits. Popular will can be as destructive as, or even more destructive than the unfettered discretion of "the few." With the implementation of procedural rules to promote a strong rule of law, society is forced to act with long-term interest in mind and guided by reason. The marker of a society that truly respects human rights and freedoms is when it is a society where lawyers can freely and without obstruction represent those who are the most condemned, feared or hated, to assure that their rights are fully respected. Not only must the society respect and promote this function, but lawyers themselves must be able to provide ethical, effective and zealous representation. A robust rule of law, however, is more than just the presence of competent lawyers. It also means that a criminal justice system ensures the equality of arms in any given case. The criminally accused must be given every assurance that he is presumed innocent until proven guilty. That he is given a fair chance in the system to maintain his innocence. 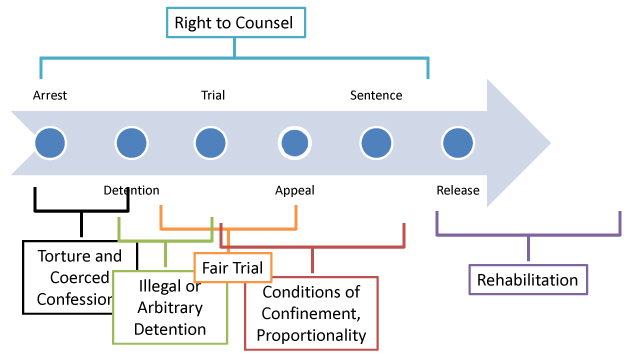 The individual must be able to access his due process rights - such as access to competent and assigned legal assistance, a right to a fair trial. There needs to be rules that protect the accused from coerced confessions, protecting them from their own statements and actions, rule of evidence and burdens of proof higher for the prosecution. The adversaries in the criminal justice system must be equal before the tribunal. Otherwise, the procedure is in danger of moral ambivalence, and insulting the system. These are all general rules for a fair and functioning criminal justice system. However, the mere existence of these rules and laws are not enough. They must be implemented to their fullest capacity. The promotion of rule of law is more than just advocating and protesting. The key to transforming these societies to human rights respecting nations is through structural change. This requires a top down, bottom up approach involving all members of society. There needs to be legal reform, political change, and societal transformation. This can only be achieved through education, discussion, motivation, empowerment, and solidarity. The training of lawyers is but one vital part of the solution. There needs to be a paradigm shift within all levels of society towards promoting the rule of law. The first step in accessing justice begins with the individual asserting his rights. Thus, knowledge is the key. By identifying how one should be treated, the individual is asserting his rights as a member of society, and also taking ownership of his society; taking a stand and claiming that all individuals are deserving of enjoying certain rights and freedoms, and that there is a minimum standard that defines how society treats its members. Not only do individuals have to have knowledge and be proactive in claiming their rights, but society must have actors that are capable and dedicated to implementing these laws. Lawyers, judges, and police officers must all work zealously and cooperate to create a system in which they meet the demands of claimants. This not only requires training to ensure competence, but also a mental shift to ensure that due process rights and promoting the rule of law remains in the forefront of their minds when they act. This mentality results in a trickle down effect (i.e. Adam Smith's invisible hand theory), in which procedures become more transparent and the good of society becomes the paramount concern. Most importantly, the relationship between the demand of rights and the capability and mentality to supply such services in the criminal justice system result in the recognition that every in the community has a stake in the healthy functioning of this system. The reinforcement of any criminal justice system thus requires action from all levels of society, as well as solidarity and activism from a community. It is necessary to consider the local and specific needs of any country and community. In this post colonial world, we have seen the effects of imperialist policies and disastrous legacies that former colonial powers left behind. There is a lot of work to be done, not only in rebuilding, but in support. It is not possible to force a community to mobilize with conviction and sustainability. This can only happen from within a community. Only through cooperation and inspiration can a foreign organization be instrumental in the process of structural change. It cannot be an imposition, but rather, a strategic alliance, in which knowledge, professional capital, inspiration, and idealism flow in both directions; benefiting all members involved, as well as society at large. History has shown how nations have mobilized and attempted to claim their rights only to face barriers such as discrimination or rampant corruption. These countries may even have all the laws and processes in place to have a perfectly functioning criminal justice system. Whenever there is public will, there will be incremental improvement. However, without structural change and support, these improvements are not sustainable. Moreover, it is necessary for standards to be invoked so that improvement can be measured and goals can be attained. Local needs and cultural responses must be considered, however, security of the person and the right to a fair trial are rights that all individuals deserve to enjoy. They are not culturally relative as no one ought to be tortured or be detained without cause. These are minimum international standards that need to be implemented. Through promotion of the rule of law and paired with activisim from the community, individuals will have access to justice and access to human rights. This page was last edited on 4 October 2012, at 13:06.